Logic Soft's mainline product -- WINBDS is an on premise software i.e. we install it at the client location and we support them remotely. Since a while now, this has been seeing a change. For small installations, usually an instance on the cloud works out cheaper and better. So we've begun suggesting people to move to AWS when the installation is small enough. This coupled with a small tool we've built, to turn on and off instances, actually has resulted in a win-win situation for both our clients and us. This now means that we need a way to quickly monitor the status of the instances that we're hosting. We're not hosting so many instances that I see the necessity to have a full blown monitoring dashboard nor are we hosting too less instances for me to check on them individually. I needed a low tech solution that does the job. If you're a C# developer and haven't invested time and money in LINQPad, then you should stop reading this blog and get right to it. It is one of those tools that increases productivity by 10 fold once you've gotten attached to it. For the uninitiated, LINQPad is a program that allows you to quickly play around with C#/F#/VB expressions/statements/programs -- A scratchpad, if you may. Think of it like a playground with great tools and features at your disposal. Go download it over on http://www.linqpad.net and play with it. Since I almost always have a LINQPad window running, I decided to write my dashboard within LINQPad itself. If you're contemplating reading on because you think that the idea is nonsense, think again. Let's start off by installing the AWSSDK.EC2 package from NuGet. LINQPad has NuGet integration built in so we can install packages for each of the queries that we write. For the Access Key and Secret Access Key, the recommended practice is to create a user specifically for this purpose from the IAM console and use those credentials. IAM is AWS' identity management platform. Here you can create users, attach policies, manage roles, etc. Basically everything to do with managing who and how they use your AWS account. For our task today, we have to create a user with programmatic access only. This user that we create isn't going to have console access because we're only looking at building a dashboard via this user. Let's start by creating a policy that can be attached to any user. A policy describes the set of allowed actions on the specified resources. So when a policy is attached to a user, that user will only be allowed to perform operations that are outlined in the policy. For this use case, we just need to be able to check the status of our instances, so what we're looking for is the ec2:DescribeInstances action. The resource that we want to be able to run this action on should be *. Unfortunately the DescribeInstaces doesn't allow to be specified for a particular resource so we have to use the * identifier for the resource (relevant thread). Let's get back to the client and throw in the credentials we picked up in the previous step. The really exciting part here, for me is how terse and readable the code is. There's no explanation of how to do something viz a viz what to do. With this done, we have the data we need, in the format that we need it. The next question is how does this magically become a "dashboard"? This function truly deserves a section for itself and in my opinion, is what makes LINQPad such a compelling tool to work with. 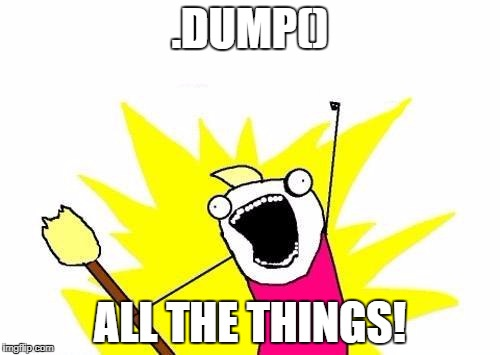 Dump is a function that is available on every object within you LINQPad queries. It attempts to show your object in the best way possible. 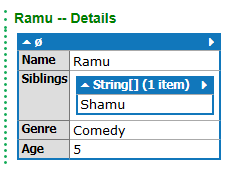 Wonderfully formatted into key value pairs, and the list within the object is well formatted too. It just doesn't stop there. 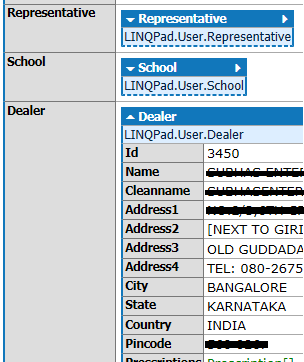 It gets even more powerful when used in a context where we query a DB using LINQ. Just like an object that we printed before. It resolves these dependencies and puts them in place! Absolutely wicked! When you're exploring a Database, The Dump() function can be a blessing. This is one of the reasons why LINQPad forms such a core part of my development environment. Let's get back to where we left things off, we now have with us a list of objects. Nothing special about that. What to we do to display it? We'll call the .Dump() function with region as the argument. This should give us a nicely formatted region wise list of instances and their status. "You don't expect me to run this all the time to check the results, right?" lprun is LINQPad's offering for running scripts from the commandline. Its default output is in the JSON format but we can change that by using the format flag. Setting -format=html outputs the exact same thing we see inside LINQPad. This works great for automation. Chuck the output into a server periodically via a scheduler task and we're good to go! This is what I did and we're more than happy with it, for now. Maybe when we have more instances, we'll scale up to a better and more actionable dashboard but this works for our current scale. If you're a C#/F#/VB user, use it!